Here’s how I increased my margin 40% for my subscription business. At Moustache Coffee Club, we recently released our internal data: From $0 to $150,000 in Subscription Revenue. But revenue doesn’t mean anything if you don’t have good margins. Today I’m going to reveal how I increased my margin 40% for my subscription business. 1. What are the dimensions & weight of your box? 2. How much distance between you & your customers? 3. How much does packaging cost? Postage can get costly very fast – it can approach or exceed 30% of your total revenue. It’s vital that you focus on minimizing shipping & operational expenses for you to run a successful subscription business. In the process of creating Moustache Coffee Club, I actually build another startup BishBashBox to help other subscription box founders. You can read about the process here: How I accidentally built a tech startup. As I started to build BishBashBox and get more subscription businesses on the platform, I was able to get volume discounts for shipping. Now every customer on BishBashBox can save between 10-40% on shipping discounts we offer. 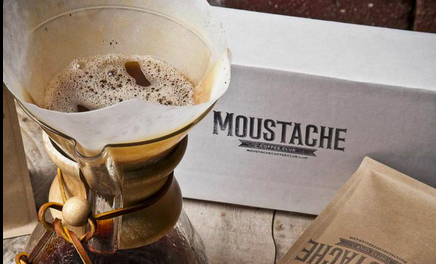 At Moustache Coffee Club, I was able to increase my margins 40% by using the volume discounts on BishBashBox. When I first started I used flat rate packages that cost $5.95. At $19 per bag, that’s 32% of my revenue! Not to mention, I was forced to use USPS flat rate boxes which looked ugly and unprofessional. I needed to do something or I wasn’t going to be making any money. I knew other subscription companies got discounts on shipping but I had no way to access the discounts and not enough volume to negotiate with any of the carriers. So, to get access to better shipping rates I coded an integration with Easypost, an awesome API for purchasing shipping. Even with a Ph.D. in Computer Science it still took a couple of days to get fully integrated but boy was it worth it. Using Easypost volume discounts through BishBashBox, I was able to get my shipping per box down to $4.05 saving $1.95, increasing my margin 40%. Now that I’m shipping 200+ boxes per month, that’s $400+ more every week for my subscription business. Delivery times haven’t change & now I ship a box that is cheaper and branded well. Want to see what volume shipping would look like for your business? I made a handy little tool, Click Here to Calculate How Much You’ll Save. Everything is now fully integrated into BishBashBox. Once you signup for BishBashBox, it’s as simple as clicking “charge your customers” and we automatically charge the credit cards on file, generate & print all the labels and send your customers their tracking codes. All you do is slap on the labels to your boxes. You can 1. watch in your BishBashBox dashboard the status of a customer’s package (great for customer service!) and 2. email customers at different stages via the easy Mailchimp integration. Have international customers? You’ll need custom papers. On BishBashBox, we automatically include this…hello easy international shipments! If you enjoyed this post, subscribe here to get more amazing info delivered to your inbox. Subscribe to join hundreds already getting ahead with our content. Previous PostHow I accidentally built a tech startup.Next PostWhy Subscription Businesses Are The Future.